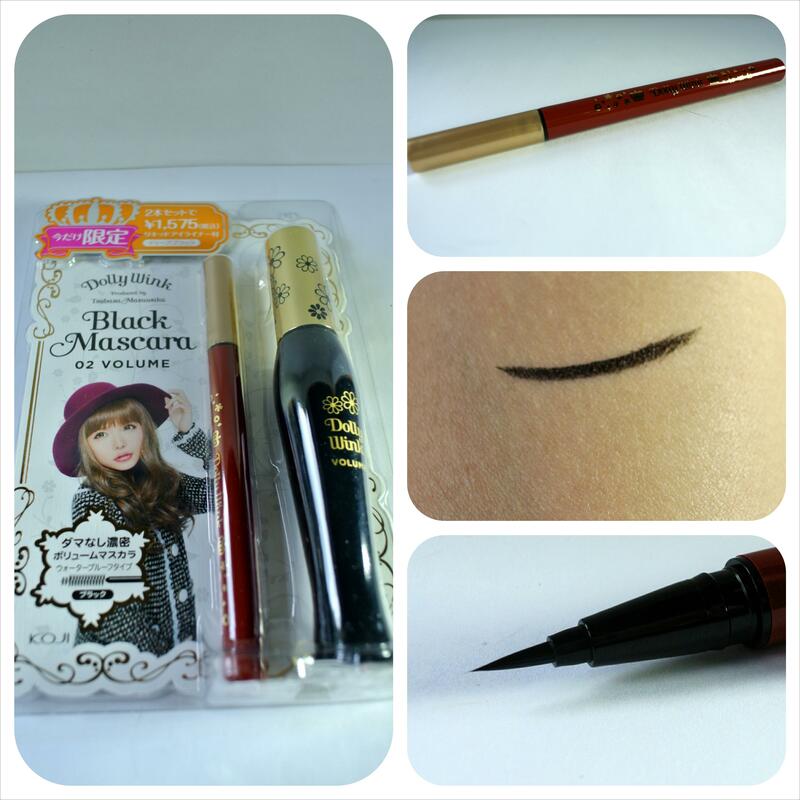 The first eyeliner is a brown liquid liner from Dollywink, a Japanese brand known for its eye products. I opted for a brown liner because I wanted to try a more subtle line for my everyday look. As for packaging it has a brown cap to correspond to the colour inside and a brush tip. There is no pump or knob to turn as the product comes out on its own, at a reasonable amount of course. Also the cap easily clicks into place to let you know you have closed it properly. Overall, I personally have not experienced any fraying of the brush tip so I am still quite pleased with the packaging as a whole. As for the product I find it comes out smoothly and consistently without break in the line. However, since the product is brown if more pressure is applied at a certain spot there will be a bit of a darker tone but nothing significant. The product sets relatively quickly which I am pleased with and intensity of the colour or line can be built up without gathering the product into a clump. On the down side I did find that it was not really waterproof as the line would disappear in the more watery sections of my eye namely the inner and outer corners. Above all it applies smoothly and easily creating a clean and subtle look which I would recommend for those looking for an easy eyeliner to use that is not waterproof and easy to wash off. I am not sure if this is from a different collection in comparison to the one from above as I purchased it as a set with a mascara and could not find it alone online. For this eyeliner the packaging is quite similar, minus the corresponding cap colour to the product inside. This liner is also a brush tip, however I have experienced a bit of fraying on this brush but it was easily fixed and works fine now. As for product the colour is not quite as opaque as the Make Up For Ever Aqua Liner, but intensity is buildable. I do like how it sets a lot faster therefore avoiding mishaps from blinking or opening my eyes too quickly and creating a double line on my eyelid. I found with this liner was a little bit more water resistant, but I would still not call it waterproof. Overall, I do like this product for everyday use as it creates a skip free line that is quick and easy to create. Once again I purchased this as a set with a mascara and was unable to find that set online so the price is not the same as the price I purchased it at. The packaging for this eyeliner has a sleeker look with a princess effect in comparison to the cutesy Dollywink packaging. Just like the two above it was a pen type eyeliner with product dispensing on its own. The applicator is a brush tip that was slightly longer in length in comparison to the Dollywink eyeliner and personally I did not experience any fraying or separating of the hairs. Do not quote me on this but the brush tip feel a little more synthetic which maybe could lead to less fraying but I am not 100% sure (this is just my guess). As for the product I found the colour possess a good level of opacity, with slightly buildable intensity. Like the ones above this eyeliner set relatively quickly and smoothly. However, because its slightly longer length in the brush tip I found it to not move and bend as smoothly like the ones above – so if you tend have rounded eyes or have difficulty with lining the inner corners you may not like this product. With that in mind it is not hard to apply so do not be scared. Overall, out of the 3 this is my favourite as the opacity and application is smooth, in combination with better longevity and slightly better water-resistance. **once again these are my opinions from my own experience – your eyes may be different from mine so of course use your own discretion. Being a fan of Marc Jacobs, I was very excited when I heard he was coming out with a line of makeup. I have always loved his style so I had very high hopes for the line. When it first came out in Sephora, I wanted to buy and try it all but the price was definitely on the higher end. With the price in mind I limited myself to one item I needed most from the collection, so I ended up buying the highliner. On the website it claimed to be waterproof, long-wearing, and colour-intense. It is described to be a gel pot eyeliner encased within a crayon. The liner contains vitamin E and rosa canina seed extract, which is supposed to soothe, soften and protect the delicate skin around our eyes. It also suggests that after applying the eyeliner you should blend it quickly as it sets within 15 seconds. With this in mind I bought it hoping it would be great for tight lining because of its smooth consistency and claim to be waterproof. In my opinion the eyeliner would not be my top choice for tight lining as it transfer to my under eyes after 2 – 3 hours. Not only would it smudge but it would also collect in my outer eye corners due to my watery eyes. When using it to line the eyes I agree the application was smooth but the line would jump creating blank spaces, also due to it being so soft, it broke easily when being used and would occasionally crumble when I lined my eyes. I tried to fix it by smudging it with a brush but the line would be really inconsistent and because it dried quickly I would not be able to fix the whole line before it set. Another problem I had with it was its diameter of the product. I would use the sharpener to sharpen it but as it drew the line it would quickly become dull because of its extremely soft formula creating a thick line. I definitely would not recommend this for drawing the winged eyeliner look. On the positive side the black liner was very pigmented and black, which I did enjoy. However, for its price and my experience with the highliner I would not purchase it again as I do prefer the Make Up For Ever eyeliners for tight lining and lining the eyes. Overall I was not very happy with this product. Since I have watery eyes it smudged faster than I anticipated. I even tried using an eyeliner brush to grab the product and then drawing it onto my eyes, but it dried faster than I could apply it. I hope they improve the product a little, because I loved the packaging and pigmentation. **If you wish to purchase the item I have provided a link. Just click on the photo and it will take you there .